Who Should Apply to HBS? My comprehensive service clients have been admitted to the regular HBS MBA for the Classes of 2014, 2013, 2011, 2010, 2009, 2008, 2007, and 2005 and one 2+2 client admitted to the Class of 2014. My clients&apos; results and testimonials can be found here. In addition to providing comprehensive application counseling on HBS, I regularly help additional candidates with HBS interview preparation. I have worked with a large number of applicants from Canada, Europe, India, Japan, other parts of Asia, and the United States on HBS application. I think that this range of experience has helped me understand the many possible ways of making an effective application to HBS. In the posts in this series, I provide insights based on that experience. Well, based on what I wrote in the first post in this series, my short answer would be anyone who wants to should give it a try. While obtaining three recommendations might be troublesome for some applicants, the essay set for the Class of 2015 (and 2+2 Class of 2017) is not a barrier to application. That said, there are both objective ways (Acceptance rate, Age, GMAT, GPA, TOEFL) and subjective ways (Is the curriculum right for you? Is the competitive atmosphere of the program right for you? Would you feel comfortable in the HBS Community?) to assess whether you should apply. We will examine each in turn. By the way, f or a happy story of HBS rejection, see here. At the time of this post (May 29, 2012), the Class of 2014 profile has not be added to the HBS website, so my comments below are based on the Class of 2013 profile and prior years. JUNE 17, 2012 UPDATE: Now that HBS has provided the preliminary Class of 2014 profile, I have altered my comments below. Once the final class profile is provided in September, I will write about it. Compared to the Class of 2012 (10% acceptance rate), it was 2% easier to get into the Class of 2013, but actually the typical rate in recent years has been 12%. For the Class of 2014, the preliminary profile is that acceptance rate is now 13%. Assuming this does not change, it would indicate that it became somewhat easier to get into HBS as the number of applications has dropped from 10,368 (Class of 2012) to 9331 (Class of 2013) to 8963 (Class of 2014). It is possible that one reason for making the essays much easier to write is to increase the number of applications in order to return to prevent this acceptance rate from increasing further and ideally to decrease the acceptance rate. 1. Percentage of Finance Professionals Trending Slightly Upward After Decrease in Class of 2013. It was big news when the percentage of financial professionals dropped from 32% (Class of 2012) to 25% (Class of 2013), but this trend seems to be moving slightly in the other direction with the Class of 2014 having 28% of the class coming from the financial industry. 2. The percentage of women admitted to HBS continues to increase.For the Class of 2013 it was 39% and for the Class of 2014 it is now 40%. From the outset, I want to mention that I will have one client in his or her early 30s in the Class of 2014. I will not be specific about the gender or exact age of this person i print. 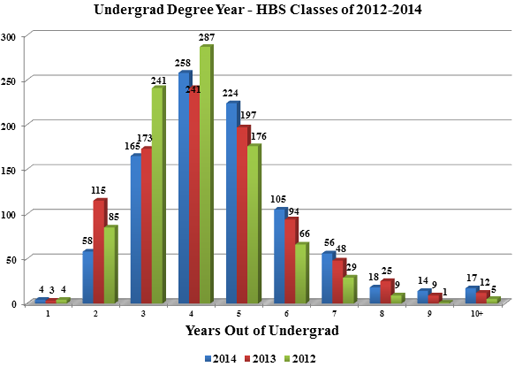 My point is simply to say that while it is hard for older applicants to get admitted to HBS, it happens every year. Whatever your age, just keep in mind that it is only one factor. As the chart below indicates 2014 was relatively speaking a very good year for older candidates to HBS. 1. The chance for admission to HBS when you are 30 and over at the time of matriculation looks pretty low, but keep in mind that their may be less such applicants actually applying to HBS. Also keep in mind that low does not mean none! 2. There is a chance for admission for those over 30 and the percentage is so small because the entering class at HBS is huge. It is important to consider that while HBS only admits 13% of those that apply, it is a giant and diverse class. 3. Applying to HBS when you are 30 or older appears risky and hence should be combined with application to other programs except for those applicants with a very high risk tolerance. Of course, applying to HBS is relatively risky for any applicant. 4. Whatever the acceptance rate for older candidates, given that this application is not particularly challenging to complete, it is worth applying if you have the time and desire to do so. According to the Class of 2014 statistics, the average age for the class will be 27. Being age 26-28 is clearly the sweet spot for HBS, but it is not the only spot. Curiously, HBS does not provide GPA statistics in its class profile. According to the U.S. News premium edition (I subscribe), the average GPA is 3.66. That is rather high, but does not show the range of GPAs that HBS accepts. I have had clients admitted with GPAs at and slightly below 3.0. However if you both a low GPA and a low GMAT (GRE), you will need to find other ways of demonstrating your academic potential (“Analytical Aptitude and Appetite”). GPA, like GMAT (or GRE) is just factor. Especially if you attended a particularly challenging undergraduate program and your GPA is low, this is not a reason to abandon applying to HBS. Assume that your GPA will be seen within the context of your overall academic record. While the median GMAT for the Class of 2014 was 730, it is important to look at the range of scores represented, 570-790 (It was 490-790 for the Class of 2013). While it is generally the case that scores below 650 make it particularly challenging to enter HBS, clearly some people are getting admitted with much lower scores. I would never use GMAT as the reason to not apply to HBS. Just keep in mind that academic potential is one of the three core admissions criteria for HBS, so if you can’t demonstrate it in your GMAT, it is best that it be demonstrated elsewhere in your application. HBS does not differentiate between taking the GMAT or GRE, but they don’t, as of yet post any data on GRE. Based on my off the record conversations with admissions officers, they don’t have enough data to fully accept GRE’s GMAT comparison tool, but I think applicants will just have to go with that tool to get a rough idea of comparable scores. While this seems like a final statement, if your score is close to the minimum required score, but below it, say a TOEFL 107-108, I would not suggest abandoning HBS as I aware of cases where applicants with such scores were interviewed and/or admitted. However, it is critical to keep in mind that the required English communication level (Ability to listen to native-level speakers and effectively participate in a fast moving class environment) to survive at HBS is higher than at other top US and international programs. As many have pointed out, the typical international student at HBS is often pretty much indistinguishable from the American students in terms of linguistic ability, but not all are. There are many factors that I am not accounting for here, such as location, but instead I am focusing on some of the more common reasons for deciding whether to apply to HBS. HBS typically “fails” (most can come back after addressing whatever problems they have) 1-2% of first year students every year. This rate is generally considered to be high. I think this is a function of the grading system, the fact that the program is huge, the necessity to perform reasonably well in a section of 90 on a regular basis (class participation really matters, which is HBS requires high level English ability), the work load, and the limited amount of information that is used for assessing some many candidates. Not all MBA programs are academically challenging to the extent that HBS is. I can’t quantify this statement, but given the fact that I keep in touch with many of my former clients and conduct Q&As with some of them for my blog, that I visit MBA programs, and that I try to talk with MBA students about their experiences when I meet them, I quite certain that HBS is particularly challenging in respect to academic demands. If you are looking for more time to develop your own business plans or to figure out what you really want to or to relax a bit or really engage in clubs activities, I suggest looking elsewhere. Most other top US and international MBA programs are likely to give you more breathing room. On the other hand, if you looking for an intensive leadership and general management focused education, HBS is ideal. If you are looking to engage with the some of the smartest and highly driven people on the planet, HBS is ideal. If you are a highly competitive person, HBS is ideal. If you want a more collaborative environment look elsewhere (Start with HBS’ neighbor, MIT Sloan). If you want a flexible curriculum for most of your two years in an MBA program, don’t bother with HBS. Even with recent changes to the curriculum, just look at the Required Curriculum, which consists of 10 set courses and a year-long field course. By contrast, the second-year at HBS is totally flexible. Based on my conversations with HBS students and alumni, I think there are real advantages to the HBS first –year curriculum because it makes students fully engage in courses that they might otherwise try to avoid. The curriculum forces students to confront areas where they might be weak. It also makes students develop a common body of knowledge through cases that form a real core general management education focused on leadership. Students and alumni tell me that this process changes and expands the way they think about problems and look for solutions. What it does not do as intensively as some other programs is help someone develop quickly develop high-level expertise in a particular subfield such as entrepreneurship, finance or operations. The second-year can be used for that purpose. On the other hand, there are many other programs where such expertise can be developed at a greater degree of intensity throughout all or most of the two years of the MBA. It is really question of what kind of education someone is looking for. I don’t think this factor can be ignored, but it should not be overstated either. HBS clearly has the best worldwide brand recognition of any MBA program. That can be a very powerful thing for someone’s future career. I am not stating that HBS is the world’s best MBA program as I don’t think that statement has any value. It is certainly the best MBA program for some people, but so are all the other programs! However I do think it is worth keeping the brand in mind when deciding on HBS or any other school. HBS passes the grandma test (If you told your grandmother that you were going to HBS, would she be impressed?) in a way that no other MBA can. What applies to grandmothers, also apples more generally. Being associated with this brand can drive some people to apply to a program that really is not what they are looking for and/or will be admitted to. On the other hand, if you have looked beyond the brand and see fit with HBS, you should certainly apply. Whatever objective categories you might fall into, just operate on the assumption that you are more than your statistical breakdown. The admissions process at HBS goes beyond such facts to the individual. If you think you are right for HBS, the only way to find out is to apply! In my next post, I discuss the essays. I am a graduate admissions consultant who works with clients worldwide. If you would like to arrange an initial consultation, please complete my intake form . Please don&apos;t email me any essays, other admissions consultant&apos;s intake forms, your life story, or any long email asking for a written profile assessment. The only profiles I assess are those with people who I offer initial consultations to. Please note that initial consultations are not offered when I have reached full capacity or when I determine that I am not a good fit with an applicant.